This post was originally published on the WebMarketCentral blog in January 2010. Despite the fact that Twitter has more than 32 million users, has received massive publicity from both celebrities and government, and produced remarkable results for companies like Dell and Zappos, many business executives still don’t “get” Twitter. Granted, there is an awful lot of noise (“Just got back from the gym…eating pizza again for lunch…watch a Seinfeld rerun”), self-promotion and spam-like content on the world’s most popular microblogging service—and to newbies it can seem like a bizarre online cocktail party where everyone is shouting and no one is listening—but for those who understand and learn to use it effectively, Twitter can be a powerful business tool. Here are seven reasons every business needs to be on Twitter. For most business, it’s far easier and more profitable to generate continued or new business from existing customers than it is to acquire new ones. Growing existing customer business requires ongoing communication. Staying in touch with customers on Twitter is not only more real-time than many other techniques, it’s also far more cost-effective than direct mail, attending trade shows, picking up the phone, or even maintaining a customer newsletter. It’s not that Twitter can replace other touchpoints completely of course, but it can reduce the required cost and frequency of high-touch interactions. Just as many of your customers are probably on Twitter, so are your prospects. They care far less about your advertising than about what your customers are saying about you, and how you respond. An active Twitter presence enables you to demonstrate strong customer service, rather than just claiming you offer it (after all, who advertises poor customer service?). Industry analysts, journalists, bloggers and other influencers from most sectors of the economy are well-represented on Twitter. Tweeting content of your own that will interest them (i.e. not just your marketing materials), retweeting content they post, and engaging in dialog is a great way to get these people talking, and writing, about your company. It’s less formal, more “social” and usually more effective than “cold” outreach. The fact that customers, prospects and industry thought leaders are all using Twitter make it a valuable tool for monitoring the topics and concerns being discussed. This is a great potential source of new product/service enhancement ideas as well as topics for blog posts, white papers or other content. Prospects don’t care about your products or services—they care about solving their problems. Demonstrating your knowledge of their industry and their challenges, for example by tweeting your thought-leadership blog posts and white papers, makes you a resource they can go to for helpful information. That gives you the opportunity to explain how your products or services can help them, in a consultative fashion. Business websites are, necessarily, one-to-many communication. No matter how compellingly your site presents your value proposition, it’s still formal and impersonal. Twitter is a much more casual and conversational. Again using the example of Zappos, CEO Tony Hsieh has been successful on Twitter by sharing his personality. Unlike a company website, Twitter is immediate, informal and personal. As noted above, your customers, prospects and key influencers are already having conversations about your industry, your competition—and quite possibly your company—on Twitter. If you aren’t participating in that conversion, you’re missing valuable intelligence, business opportunities, and possibly even the opportunity to prevent damage to your firm’s reputation. Twitter is far more than a 140-character soapbox for celebrities, spammy “Internet marketers” and the incorrigibly obnoxious. 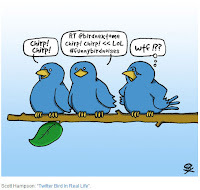 Savvy business tweeters can filter out the cacophony and create valuable dialogs with key participants in their marketplace.